Focus Home Interactive has released a ten-minute gameplay trailer for Mordheim: City of the Damned, a tactical action game with RPG elements, announced back in March. 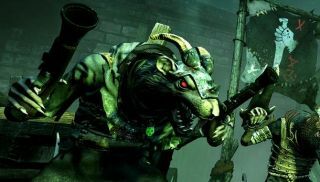 The setting, a spin-off of Games Workshop's Warhammer Fantasy universe, is grim, and life for those who prowl and fight within the shattered city of Mordheim is violent and, more often than not, short. Mordheim: City of the Damned is turn-based, but the battle between human mercenaries and the Cult of the Possessed unfolds fairly quickly nonetheless. The narrator explains that the story campaign features "an authentic narrative over multiple maps across the city," while the skirmish mode makes use of procedurally-generated maps and also allows players to select from a pool of pre-generated maps. The trailer is wrapped in the usual "pre-alpha" disclaimer, but the basic mechanics on display seem fairly well solidified. Mordheim is set to hit Early Access on Steam sometime this month. In the meantime, if this looks like your bag, you can find out more about what's in store at Mordheim-cityofthedamned.com.